I've just started to quill. What kind of paper should a beginner use? Computer printer paper cut into narrow (1/8 inch or 3mm) strips will be fine for practice. When you're ready for true quilling paper, it's easiest to order it online because you'll find a much better selection than in craft stores. U.S. quilling suppliers are very good and carry U.S. paper brands such as Paplin, Lake City and Quilled Creations, and also the U.K. brand, J.J. Quilling Designs. Paper is quite inexpensive, but you might want to sign up for mailing lists as sales are offered periodically. All ship internationally as well. I can't seem to get the hang of quilling. How long does it take to learn? 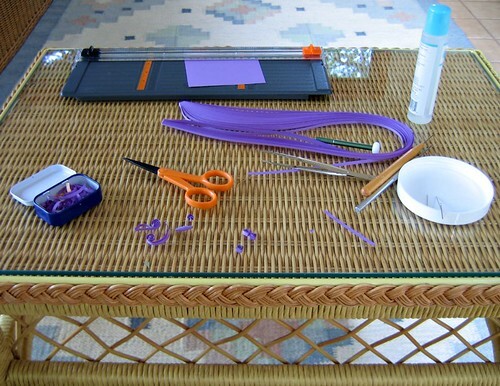 Quilling is one of those things people think should come very easily just because the supplies are so simple. Rolling paper begins to feel completely natural after a couple of hours of practice. Not bad for a hobby that may last a lifetime! Feeling all thumbs at first, I had to keep telling myself that if other people could do it, so could I - it's only paper and glue after all. What type of quilling paper handles best? There are many beautiful options... plain colors, pearlized, metallic, vellum, parchment, gilded-on-edge, and graduated colors are just some of the choices. Each type handles slightly differently, but all roll smoothly. Quilling paper is a bit heavier and softer than computer paper. Strips are available in several widths ranging from narrow (about 1/16 inch) to 1 inch and most are packaged in multi-color packs, as well as single colors. 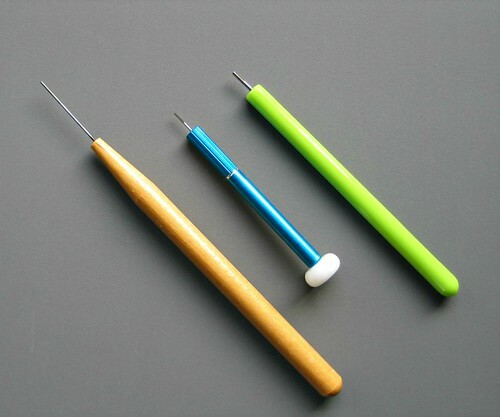 What quilling tool do you use? My favorite tool has an ultra-fine slot... the center crimp that results from the slot is barely noticeable. You can read more about it here. I use a standard slotted tool to make folded roses and when I want coils with round, crimpless centers, I use a needle tool. All suppliers sell a variety of tools; you're sure to find one that works for you. If you want to get started immediately while waiting for your tool to arrive, use a stiff wire... my first tool was a muffin tester from my kitchen drawer! What type of glue do you recommend and how do you apply it? My favorite is a clear gel adhesive because it doesn't develop a surface skin compared to white craft glue. 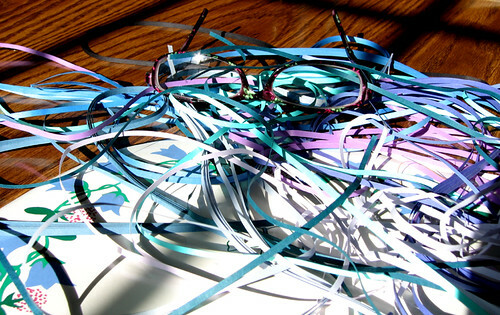 It has no odor and, like quality quilling paper, is acid-free. My method of applying glue to a coil is to put a dab on a plastic lid, then pick up just a very small amount with the tip of a paper piercing tool, cocktail stick, or T-pin. Some prefer to use an ultra-fine tip glue applicator. How do you know what size to make loose coils? I see patterns that say to use a three-inch strip rolled into a loose coil. I have a circle sizer board , but don’t know what length strip should go into what hole. Is there a standard? Ah, the age-old question... actually, there isn't a standard. Your three-inch strip may make a slightly different size coil than another quiller's three-inch strip - it just depends on how tightly you roll the paper. The important thing is to roll with even tension and your work will have a nice uniformity. The circle sizer helps to make coils a consistent size. Don't your hands cramp when you quill? I'm happy to say the answer is no. It can happen if one holds a tool too tightly and/or works for a long time without pause. Let's face it, any type of repetitive motion can lead to injury. Consciously keep a relaxed grip on the tool and stretch your hands and fingers occasionally. You might want to tape padding around the handle for comfort. It's a puzzle to me why companies don't routinely design all tools with ergonomically correct handles. How do you do on-edge quilled lettering? Quilled lettering has become very popular - no surprise, as it lends itself beautifully to monograms and quotes! I give specific tips on how I do lettering here. Where can I buy card stock weight quilling paper to do lettering? I can't seem to find quilling paper that is thicker than regular paper. True quilling paper is not as heavy as card stock, which generally doesn't roll smoothly. If you are planning to do a curved strip, on-edge design (as for lettering) try inexpensive - in other words, very thin - card stock. For lettering, I prefer to use two regular strips of quilling paper glued together. Between the double thickness and glue, the paper becomes quite sturdy, but still rolls smoothly. Keep a damp cloth handy and run it down both sides of the strip to wipe away excess glue as soon as you've stuck them together. Then put the strip aside and wait until the glue is completely dry before trying to roll it. What do you use to coat your finished quilling? I generally don't apply a fixative because I like the natural look of paper. Some fixatives result in a shiny, plastic finish and the application may cause coil centers to swell. If I've made a framed piece, the glass protects it. If you are concerned about excessive humidity, brushable Liquitex Varnish is good and is available in Gloss or Matte. Apply a couple of very thin coats, never too much at once. How do you store your quilling paper? It's oddly satisfying to quill a tidy project after starting with such a jumble, but I also enjoy working with strips that are still attached at the ends, fresh out of the package. How do you mail a quilled card? Ideally, I would use a sturdy, shallow box lined with bubble wrap. In lieu of that, place your card between two sheets of cardboard and then in an envelope. If you use a bubble wrap mailer thinking it will provide enough protection, the card may bend - tragedy! - so I would include a sheet of cardboard under and on top of the card. My Quilling Nest sells ingenious mailers for quilling. The scored cardboard is easily folded to make a boxelope. I place a layer of bubble wrap over the front of a card as extra protection. What quilling books do you recommend? Thank you for asking! My newest book, The Art of Quilling Paper Jewelry, is geared to both beginner and experienced quillers who are looking for new ideas. All Things Paper: 20 Unique Projects from Leading Paper Crafters, Artists, and Designers includes several quilled jewelry designs and frameable projects. Creative Paper Quilling: Wall Art, Jewelry, Cards & More is a compilation of designs from a number of American and Canadian quillers. Have you made any quilling videos? You can watch me quill on the HGTV show, That's Clever. You also might enjoy this article that I wrote for the Craft Industry Alliance about quilling trends. May I sell items that I make from your patterns? While I would be happy for you to recreate my designs that you see on this blog for your own personal use and/or to give as gifts, the Creative Commons license that is posted on this blog indicates the content I share is not for commercial purposes. Also, the projects in The Art of Quilling Paper Jewelry may not be made to sell. On the other hand, you may make and sell items made from the instructions in my other books, All Things Paper and Creative Paper Quilling. If you would like to be notified about new posts and tutorials, sign up for the occasional and free All Things Paper newsletter here.